Anyone Can Dance® is a program of adaptive dance created by Judith Sachs, a certified dance and exercise facilitator. It is designed for people 65 and over, or for those who may have physical restrictions/use a wheel chair or a walker. Benefits include aerobic conditioning and improved flexibility, coordination, posture, muscle tone, attitude and body image. Judith Sachs is a certified dance and exercise facilitator. She has been dancing since the 60’s, when she studied with Alvin Ailey, Deborah Jowitt, Arthur Mitchell and others. In spite of two hip replacements, she has been teaching chair dance, tai chi and yoga to seniors and mixed classes since 1996. She teaches Silver Sneakers® and Dance for Parkinsons®, as well as her own brand, Anyone Can Dance®. REGISTER HERE. June Outreach in the Community. Heaps of thanks to our JUNE ARTISTS for sharing creativity and compassion with hundreds of people in our community who live with special needs and/or circumstances. See our full calendar here. 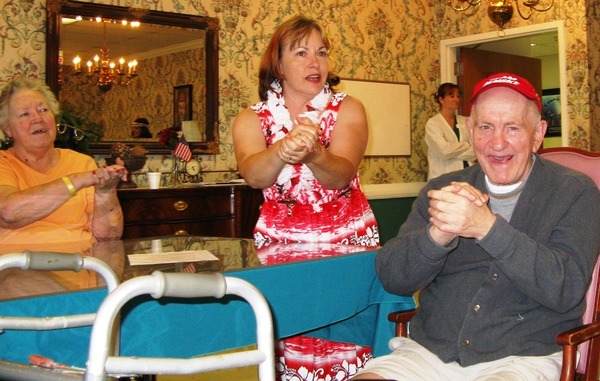 Caregivers, consider bringing your care partner to one of our programs so they can enjoy the social, emotional, intellectual and physical benefits of creative engagement with others. get info & tickets here or call MaryAnn at 757-754-4486. POETRY WORKSHOP MAY 18 RECAP Pauline Daniels, Creative Engagement Director at Goodwin House in Alexandria, worked from a seemingly endless toolkit as she shared anecdotes, truisms and more than a dozen types of poetry to draw from when working with elders. Service through the Arts - Artists and volunteers, we want to share your program stories in June. Email your short recap to Anna@TidewaterArtsOutreach.org, or post and tag #TidewaterArtsOutreach on social media. Help us give your good works a wider audience. Thank you.